I hope your weeks are going well so far and that you’re all finally being blessed with sunshine and fun! It’s still pretty overcast here on the East Coast and we still don’t have any power, but we’ve finally checked into a hotel so I can get some work done. Today we’re going to take a look at the digestive tract and a particular dysfunction, leaky gut, that could be keeping you bloated and sick. What is the Digestive Tract? A long “tube” one cell thick through which all ingested food passes. Lined with villi and microvilli, cells that produce enzymes to help digest and assimilate the food we eat. Lined with bacteria (good and bad) that also help us digest and assimilate the nutrients from the sweet foods we eat. Functions as a barrier between us and the external world (the foods we eat). Selectively allows certain molecules to pass through into our bodies while keeping out harmful things via tight junctions, the “doormen” of our bodies. Supposed to keep out antigens, pathogens, and toxins while letting in nutrients and water. Foods should be broken down into single amino acids, simple sugars, and monoglycerides before absorption as these are the forms of our foods that our bodies recognize. Sometimes the doormen can get overwhelmed by a diet rich in allergen-provoking foods or toxins, which causes trouble down the line! What are Some Common Causes of Leaky Gut? Excessive alcohol consumption—causes inflammation and damages the tight junctions. Also feeds bad bacteria and yeasts, which can lead to an immune response, inflammation, and lead to increased permeability in the gut. Excessive antibiotic use—causes an imbalance in good and bad bacteria. Constant intake of gut irritating foods such as grains, legumes, beans, and sugars—contain phytates and lectins that can cause inflammation and irritation. Ingestion of foods to which you’re allergic—constantly eating foods to which you have an allergy creates an immune response in the digestive system and leads to increased permeability. 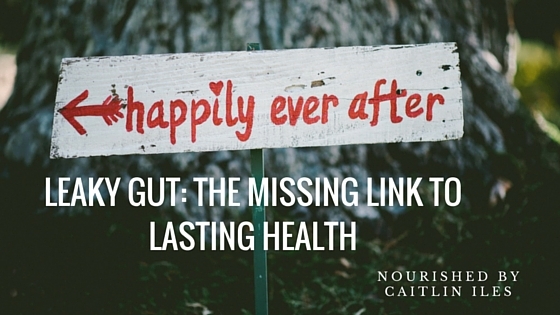 What Happens When we Have Leaky Gut? Improperly digested food particles sneak through the gaps in our intestinal wall. These foods are recognized as foreign invaders by our immune systems. Our bodies mount an immune response to neutralize the foreign proteins. Can cause a chronic inflammatory response in the body. Inflammatory compounds can circulate and attach themselves to vulnerable areas of the body—joint tissues are especially susceptible. The body can begin to mistake our own proteins for foreign proteins, which can lead to autoimmune conditions. What are Some Symptoms of Leaky Gut? Autoimmune conditions: lupus, rheumatoid arthritis, Hashimoto’s thyroiditis, etc. As you can see, leaky gut is no joke! In order to fully protect our bodies and our health we have to ensure that we’re eating the right foods. Tomorrow I’ll give you some tips and tricks for healing a leaky gut, but for now you can check out these excellent resources.